120mm fan guards protect cabinet cooling fans from damage by foreign objects or fingers. Plastic fan guards from GardTec are available in a variety of colors. This fan guard is 120mm long and 3.3mm thick. Our fan guards are built durable and lightweight to for optimal cabinet cooling fan protection. GardTec fan guards are made to keep fan noise to a minimum while increasing the amount of airflow for more efficient cooling. 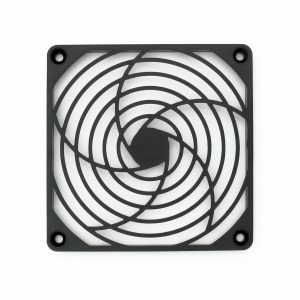 These fan guards are available individually or in bulk for great value. GardTec cabinet cooling fan kits and fan accessories are available for high quality, reliable appliance and electronic cooling.